'All, all, all' - Almog Behar on teaching a toddler inclusiveness. Or all the fresh roll. That those are just pieces. This poem starts out with a father’s close observation of his young son’s behavior – and concludes with a statement of what children should not be taught. The father doesn’t want the child to learn that the puzzle pieces are of value alone as “just pieces.” Rather, he should learn how to put together a complicated whole from the seemingly random fragments. Legos aren’t just discrete, colorful toys: They enable the creative making of new things. Says the father: Eat the whole roll – joyously; take all the nourishment there is, learn lots. Under the father’s tutelage, the son, who is already a master of the emphatic rhetorical rule of three: “All, all, all” -- will delight in an inclusive whole, rather than on bits and pieces. 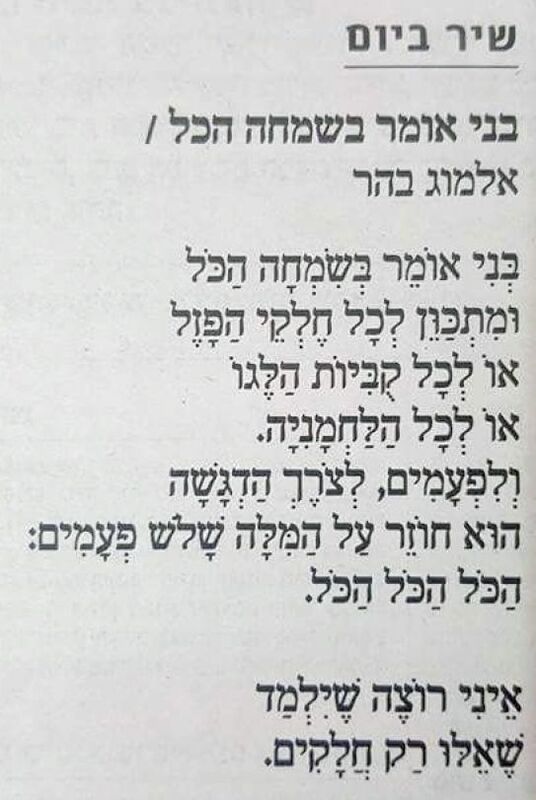 There is a bitter culture war raging in Israel over the narrative of Ashkenazi hegemony and suppression of Mizrahi culture. The term “Mizrahi” is used to denote Jews from almost anywhere except Central and Eastern Europe, whose grandmother tongues were never Yiddish but rather dialects of Spanish, Arabic, Berber, Persian or Aramaic. The belligerent sides in this war see before them – like the child the father in the poem does not want his son to be – only a bunch of unrelated and unrelatable bits and pieces. Each piece has value for some people and not others: Israeli Culture Minister Miri Regev has said: “Read Chekov? Not me,” while artist Yair Garbuz disparaged visits to holy men’s graves. The culture warriors have no view of something new enabling delight in elements of both, or rather, all, sides. 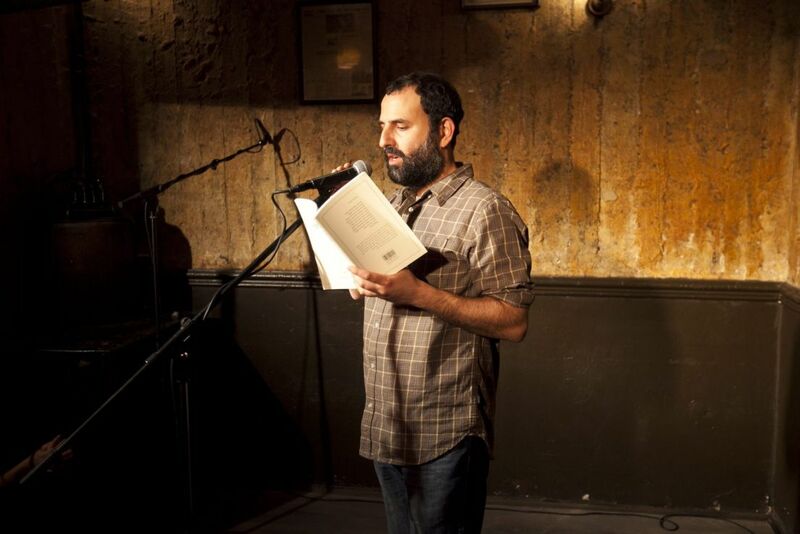 The poet, Dr. Almog Behar, encourages exactly such joy in everything that is out there, and wrote in an essay of his “strong desire to learn about things that are far from me and different from me.” He was born in 1978 to a family of mixed Baghdadi, Turkish, German-speaking origins and Danish origins, translates from English, has published books of both poetry and fiction and is a fellow at the Van Leer Jerusalem Institute, examining the relationship between Hebrew and Arabic in the writings from the Jewish communities in the Arab world during the 20th century. The Ashkenazi-Mizrahi culture war is a silly war based on vast oversimplification, mixed with elements of religious behavior, political ideology and class. There can be no winner, only losers. 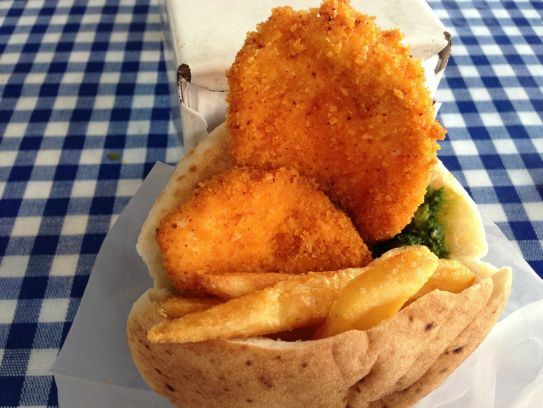 The best outcome combines elements from different heritages, like schnitzel in pita, but in the arts. *Bonus: The Bach/Gounod “Ave Maria,” version by Yemenite Israeli singer Achinoam Nini (Noa).